Earlier this summer, my husband and I took a short weekend getaway as a quick babymoon. Taking a small (or large!) babymoon is, to me, especially important to take a breather during preparing for a baby's arrival, in addition to relishing that last time you can go somewhere without having to either find a babysitter or bring a child with you. We made our way to the beach and got in some great R&R time before heading back home, back to work and back to finishing up things around the nursery and checking other less-fun things off pre-baby punch list. While the majority of my focus was on simply relaxing and not stressing about everything still left to do (which, if you know me, is hilarious), I still worked to be less wasteful. I noticed that the beaches promoted the phrase "Leave only footprints", although it seems like many beachgoers weren't too worried about leaving some of their trash behind. We spotted a few morning walkers picking up trash as they went, which was inspiring. I packed my water in a trusty reusable water bottle, and thanks to the water pitcher in the hotel lobby, I was able to fill up on our way out without having to hunt down a water fountain or resort to bottled water. We brought reusable coffee cups, and my husband packed our small travel coffee pot, so we didn't have to use single-use coffee pods or filters. I also packed my Vitamin A swimsuit and a hand-me-down maternity one-piece suit, along with two borrowed beach hats from one of my cousins-in-law. My red cover-up is from my great aunt as well. We may have had a short trip, but it was pretty perfect. 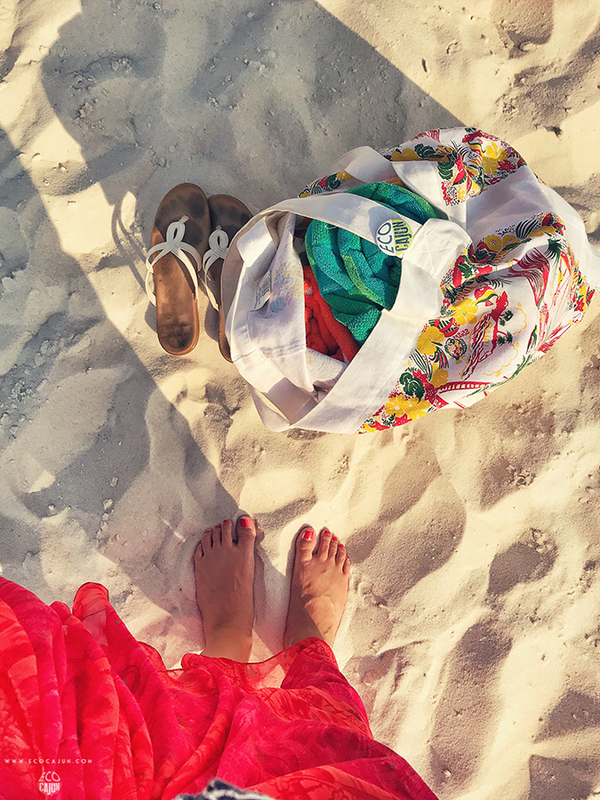 And yes, we know that next time we head to the beach, we won't be toting just one canvas bag of stuff, ha!